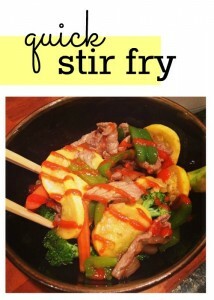 If you’ve got veggies and a protein, you can make stir fry! 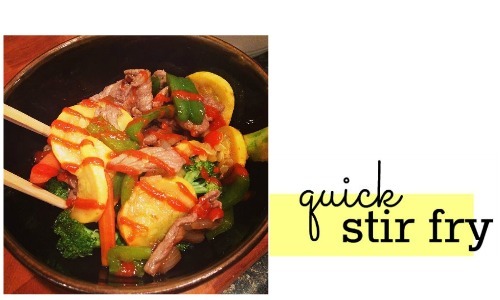 Stir fries are quick and they’re great because you can basically use whatever you have on hand. Really, you just can’t go wrong with a bowl full of veggies. And it’ll be way better than takeout! Heat the olive oil in a large skillet over medium-high heat and add the beef strips. Cook the meat until seared and browned and cooked to your desired internal temperature. Remove the beef from the pan and set aside. Reduce heat to medium and add the onions, bell peppers, broccoli, and squash to the pan. Cook until veggies are tender, about 5-7 minutes. Add the soy sauce, sriracha, and honey and stir until well combined. Continue to cook until sauce is slightly thickened and reduced, about 5 minutes. Add the beef back to the pan and cook an additional 2 minutes. Serve hot over rice and, if you'd like, with extra sriracha.